I don’t watch a lot of TV, but one show I love is Chopped! Have you seen it? I love watching the cooks get identical baskets and turn them into completely different recipes! When I heard about this Chopped at Home contest Sargento is hosting, my first thought was, “how cool – I wanna do it!” My second thought was, “I hope I don’t have to use squid ink, chocolate bars, habanero peppers and turkey in the same dish.” Yikes! Seriously … have y’all seen some of the baskets those people get?! I would probably have a meltdown trying to figure out how to use some of those ingredients! Easy enough, right? Get your apron on …. because YOU can enter the Chopped at Home contest where they could win $10,000! 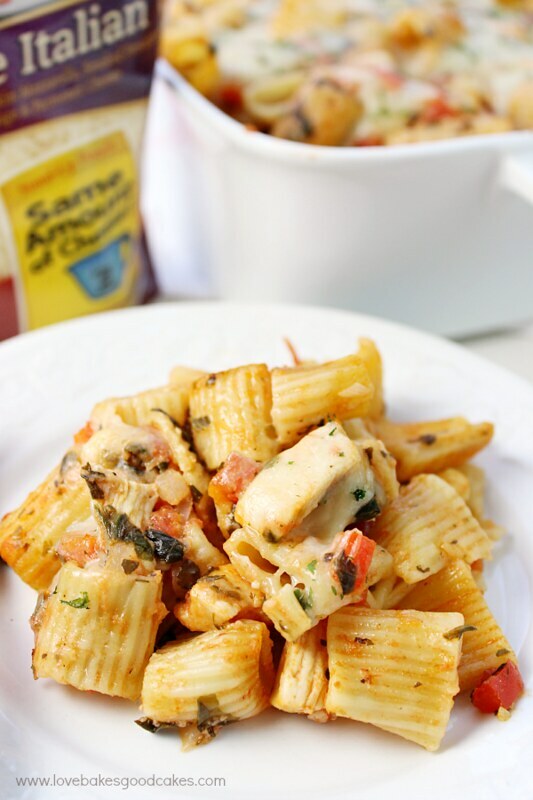 Get creative and come up with your best Chopped-inspired dish featuring Sargento® Shredded Cheese! 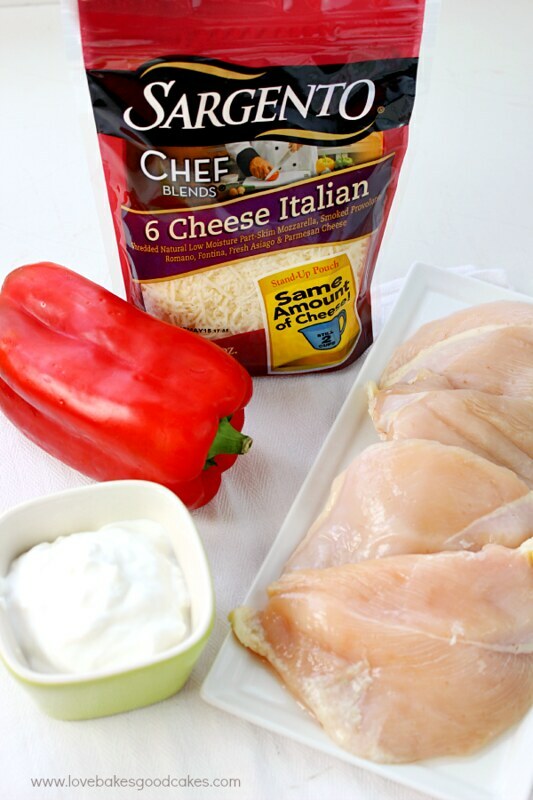 Sargento® Chef Blends™ Shredded 6 Cheese Italian is always cut from blocks of 100% real, natural cheese and it captures the authentic taste of Italy with its amazing flavor blend. 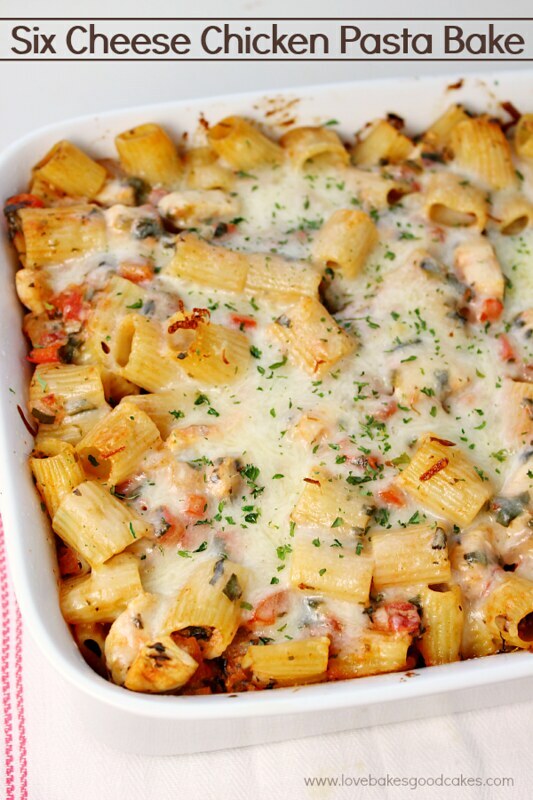 It features Mozzarella, Provolone, Parmesan and Fontina, plus Romano and aged Asiago. Use it in all your traditional Italian recipes. Just for fun, here are a few facts about Sargento …. Since 1953, Sargento has been a company dedicated to innovation. 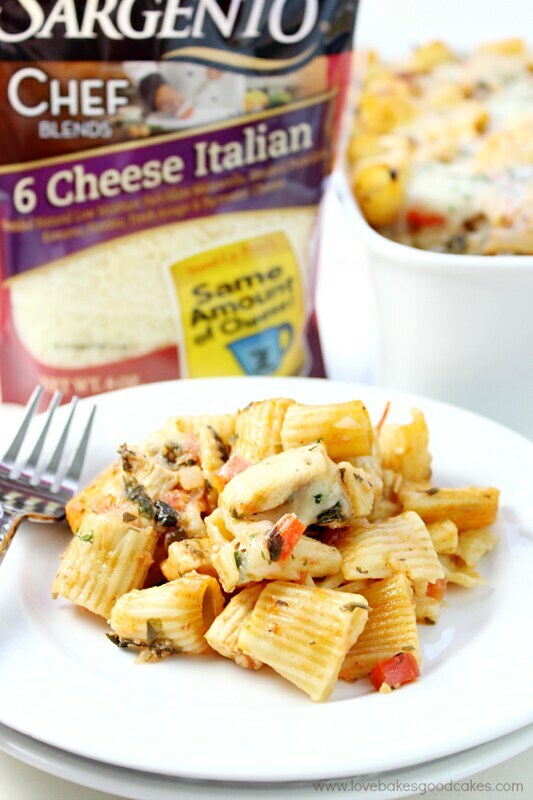 Sargento became the first company to market shredded cheese … they’ve been doing it since 1958! 1. Preheat oven to 350°F. 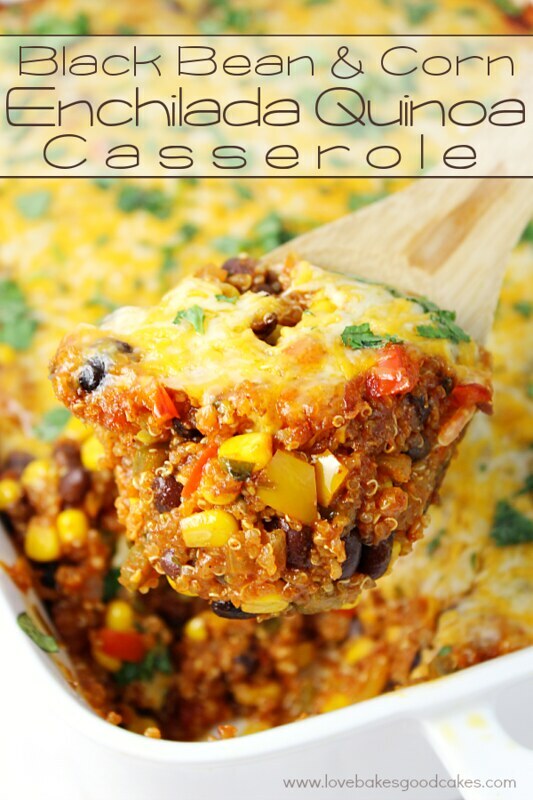 Grease a 9×13-inch casserole dish and set aside. 2. Cook pasta according to package directions, reserving one cup of water. Drain pasta and set aside. 3. In a large skillet, heat olive oil over medium-high heat. Add the chicken and cook, stirring occasionally, until chicken is no longer pink. Add the onion, red bell pepper, garlic and spinach. Cook, stirring occasionally, until the onion, bell pepper are soft and the spinach begins to wilt, about 3-5 minutes. Remove from the heat. 4. 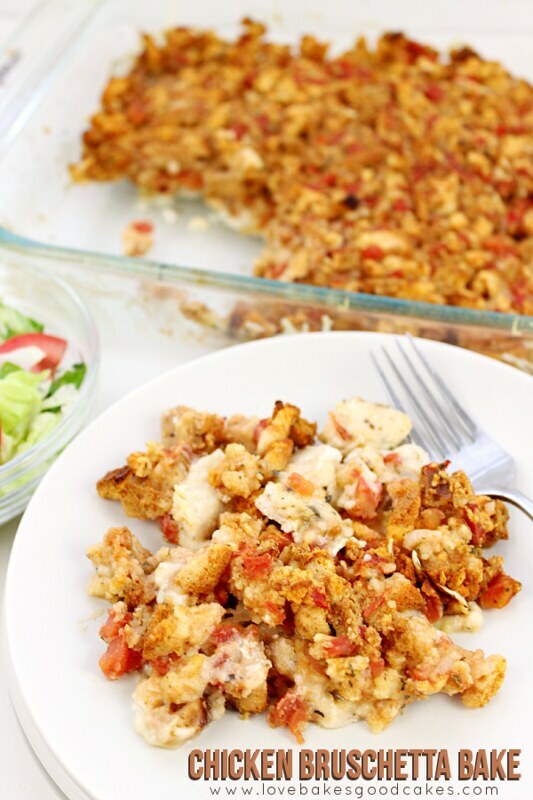 To the chicken and vegetable mixture, add the tomatoes, tomato sauce, Greek yogurt, 1 cup of cheese, reserved cooking water, Italian seasoning, red pepper flakes and sugar. Season with salt and pepper to taste. Stir to combine. Add the cooked pasta and stir to combine. 5. 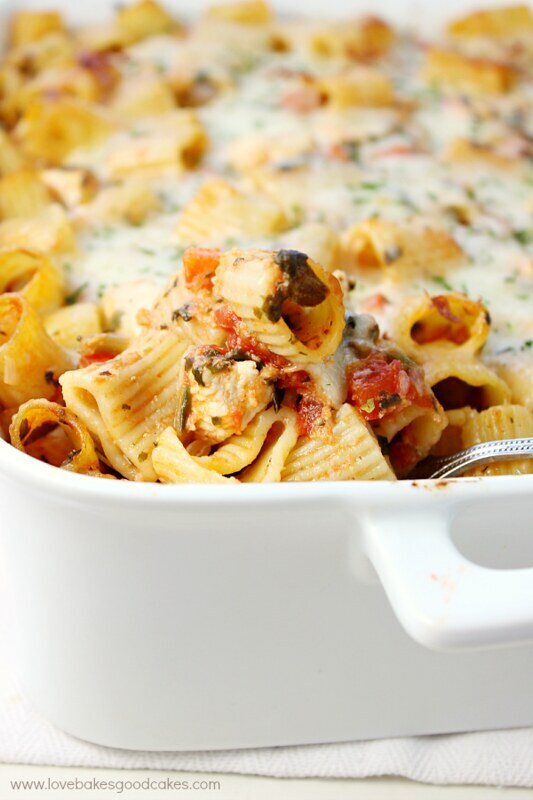 Transfer the pasta mixture to the prepared casserole dish. Sprinkle with remaining cheese. Cover with aluminum foil. 6. Bake covered in preheated oven for 30 minutes. Uncover the dish and bake an additional 10 minutes or until the cheese is slightly browned and melted. 7. Sprinkle with chopped parsley before serving, if desired. If you need some inspiration to get you started in the Chopped at Home contest, be sure to check out the Sargento Pinterest page or visit Sargento.com for more information! For more cheesy goodness, you can also find Sargento on Facebook, Twitter and Instagram! « More than 100 Banana Recipes!